Maharaja is the biggest name in Egypt when it comes to Indian food; it has nine branches around Cairo covering all areas from Sheikh Zayed to New Cairo, and Maadi to Heliopolis. We decided to give their Maadi branch a visit and see how one of our favourite Indian restaurants is keeping up the pace. Your mini trip to India starts from the first step you take inside the restaurant. You’ll be greeted by elephant statues, Indian-style decoration, and a lot of wall art. They even continuously play Indian movies or songs, and offer a few traditional Indian clothing options for you to take a picture and remember the day you spent at Maharaja. But let’s get right to the food. The menu might seem a bit confusing to amateurs in the Indian food scene, but you’ll quickly get accustomed, especially if you ask the staff to help out. Aside from the appetisers, soups, and grilled vegetables, the meat section, including chicken, beef, or seafood, is divided into two parts, in one part your choice of meat is cooked in a tandoor, and the other option is served with different sauce choices. To get a diverse and satisfying meal, we picked a few different items from the menu, they were all 70 EGP each. We started with the Palak Chicken, which comes as chicken pieces smothered in a delicious spinach sauce with the usual Indian spices, and it was quite tasty. Additionally, we ordered the Shahi Murg, which is an Indian-spiced boneless chicken leg with a unique creamy cashew sauce, which was the most authentic Indian dish we tasted that day. Our final main dish was the Butter Chicken (Murg Makhani), which is drizzled in a creamy tomato butter sauce which was smooth and tasty. Adding to our mains, we ordered a few side dishes. To make the best of these sauces we had to get some Plain Rice (30 EGP), which is steamed basmati rice served in a pot; it complemented the mains quite well. Next to the rice, we had two Indian bread types, the Plain Naan (10 EGP per two pieces), and the Butter Naan (15 EGP per piece) which has butter added to it and is baked in the tandoor oven. They also served us with an assortment of salads and appetisers, which were all brilliantly tasty despite the small portions. Our favourites were definitely the Pickled Mango salad, which has a unique taste but may not suit everyone, and the Potato Salad with a delish twist of Indian flavour. Despite us truly enjoying the flavours, we were disappointed by the portion size as compared to what they look like in the menu. The portions are advertised to work for 2 or 3 people but were barely sufficient for one hungry eater. 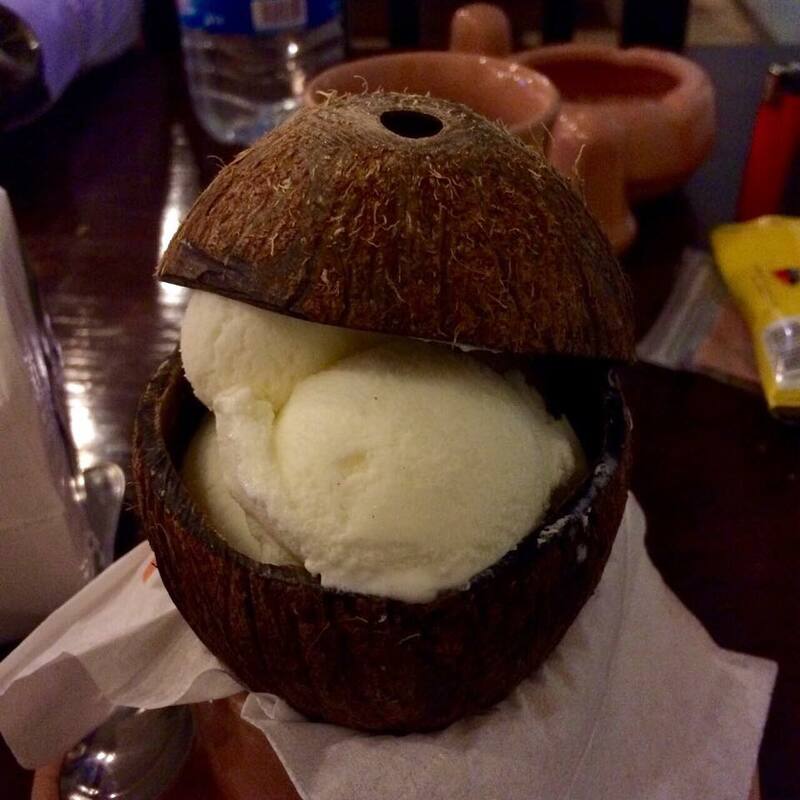 However, they made it all up for us by serving a complimentary dessert, their natural Coconut Ice Cream (originally 30 EGP), which is served up in a coconut shell, making the presentation much better. As for the taste, it was wonderful. The refreshing ice cream was the perfect conclusion to our meal. The positives definitely outweighed the negatives here, and we forgot all about the portion size disappointment, focusing instead on the great atmosphere and great food. We were even happier to see the bill had no extra tax or service charges; the price on the menu is precisely what you get on the bill. Our overall experience was delightful, Maharaja truly feels like eating at home, an Indian home indeed. Beware of the limited parking spaces. Delicious and authentic Indian flavours with excellent service. The portion size is a bit disappointing relative to the price.